S.C.A.T. 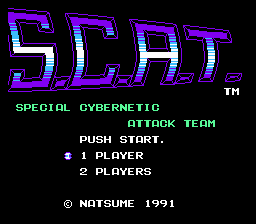 : Special Cybernetic Attack Team is an action shoot ‘em up game for the Nintendo Entertainment System. The game looks like a cross between Contra and Gradius.